Paul Salos the Frank Sinatra stylist who is becoming the hottest commodity around. His TV appearances and his many shows happening throughout the country all with the same one word response from the audiences “Wow”. Rick Honeycutt from the Entertainer magazine wrote “ Is it Frank or Memorex, neither, it is Paul Salos. He just may be the best Sinatra singer around. He is the most complete copy from the voice to the uncanny mannerisms, this reporter has seen. It’s his near perfect Sinatra routine, however that I give a perfect ten to. Do not miss his show. It is dynamite”. 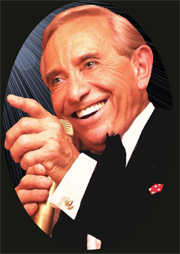 Let Paul make your Special Event a memorable one, as he sings a vast array of Sinatra songs with his “Tribute to Sinatra” show that has been winning accolades across the Country.